When I got to my boss’s office, she pulled up a page I had recently written and asked me what action I thought the content was encouraging. At first I was offended. But as I sat there, I began sweating and couldn’t come up with a clear answer (beyond that I was promoting holiday cheer). My boss then said something that has stuck with me and guided much of my work as a content specialist. She said that while my creativity may be admirable, it wasn’t strategic. Indeed, as I had not yet learned, when a consumer is on the Web, they are in a different mode than someone who is scanning a magazine or leafing through the mail. If there’s one boiled-down, oversimplified thing you need to grasp about content strategy, it is this: know your audience. Know who they are, where they are, what they know, what they want to know, and how they look for what they want to know. Most of the time — although there are exceptions to every rule, of course — your audience will appreciate fresh copy that gets to the point and features guidable keywords. Of course, content strategy includes a lot: everything from content analysis to content channel management (“presence”) to SEO optimization. But if I had to break it down for a newcomer, here is the advice I would offer. First off, you have to meet with your colleagues and draft a statement of intent for your content. Seriously, write it down, stick it above your computer, and come back to it often. What are you trying to create? How will this content promote your business goals and help satisfy your customers’ needs? Pushing out content won’t do you any good if you’re not sure of its purpose. For some examples of Web platforms in the retail industry with clear, purposeful content, I direct you to King Arthur Flour, Newman’s Own and Tom’s of Maine. The sites do not look beautiful, but they serve their purpose. King Athur Flour is a nice example of websites in the retail industry with clear, purposeful content. Once you have a purpose, you need key messages that convey that purpose to a broad audience. Pin down those key messages by collaborating with your staff. And again: write them down, stick them above your computer, and come back to them often. Incorporate them into your content creatively and as often as possible. My first Web content job was writing for a city’s tourism bureau, and I kept the city’s top 10 tourism draws taped to my computer screen (in front of my eyes) at all times. At first, it seemed like my writing was repetitive, but I began to realize that those key messages were helping me nail the company’s mission right on the nose, every time I typed. Believe me, if you do it with style, you won’t sound like a broken record. Rather, you will be clarifying why the business is important and demonstrating to your audience why you matter. This is perhaps one of the hardest but also one of the most important aspects of content strategy. After you’re done with the nuts and bolts of the content — be it for the Web or email or whatever else — you need to anticipate what kind of content your audience will want more of. What questions will someone have after seeing your work? What new developments will affect your business or change your offerings and messages? Answering these questions requires keeping on top of news and Web trends and maintaining an active, responsive relationship with your audience. Set up a feedback section of your website, if you don’t have one. Keep up with fans on Facebook and Twitter and through a blog, because one of the easiest ways to anticipate your users’ needs is by asking them what they want. Some examples of companies with good cross-platform content and audience interaction are Southwest, Zappos and American Express. Best advice? Study what they do, and then do it better. You need an editorial plan, an SEO plan, a content management plan, a content channel plan and a content distribution plan, among other plans. These plans should all be in conversation with each other. Create Excel sheets that highlight your plans. Have meetings to discuss the plans. Assemble teams for the different plans, and appoint people to lead those teams. And so on. Every member of your organization should know that these plans exist. And if they don’t know them intimately, they should at least have easy access to them. One of the easiest ways for something to go wrong, content-wise, be it poor SEO or poor spelling, is to write content willy-nilly, without a clear, plotted trajectory. As they say, Rome wasn’t built in a day, and neither is great content. Because I’m a writer by trade, I want to emphasize the importance of hiring really amazing Web writers. The people who succeed at Web writing are so much more than creators of snappy headlines and bullet points. Beyond being able to write artful sentences, good content writers are champions of analysis and synthesis. Additionally, a lot of technological know-how goes into the job. Writers need to understand user experience, Web design and information architecture, and they often need to keep track of a staggering amount of content catalogues. If you think you can hire any old Joe to crank out amazing, engaging content, think again. In hiring a Web team, finding a great content writer will most likely be your hardest task. To succeed in Web content strategy, you also need to know what not to do. Perhaps the most common mistake is overly long content. You want readers to always be engaged — and not to click away from your website — so get to your point, and get to it fast. By the same token, the content shouldn’t be too short either. To maximize your SEO, visibility and more, and to ensure the audience is engaged and entertained, you have to give ’em some meat. Make them admire your concision, but also give them enough to chew on. Another faux pas that is big but easy to fix is neglecting to update the content every now and again. As they say, keep it fresh! This is only the tip of the iceberg. 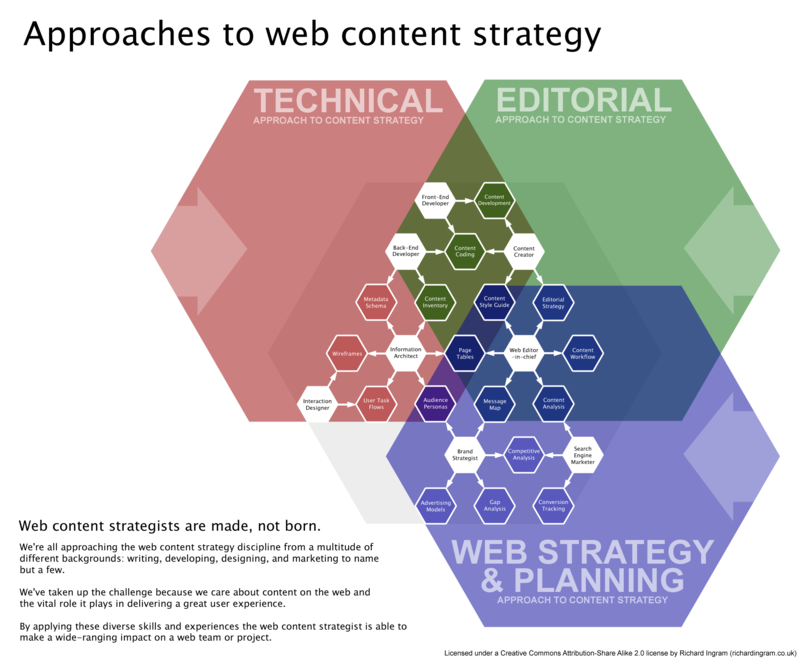 If you’re interested in learning more about content strategy, I recommend the Scatter/Gather blog by Razorfish, a great resource for anyone new to or interested in the field, as well as the recent article “Make Your Content Make a Difference,” by Web content wizard Colleen Jones. Thanks, and good luck contenting! This entry was posted in Free Resource, Tips & Tutorials and tagged Audience, business, content, Key Messages, Purpose by Sothink. Bookmark the permalink.